1. I know we’re the Huskies, but I have no idea what our specific mascot is called. I see a lot of undergrads wearing sweaters that say “Dawgs” on them, is that related? 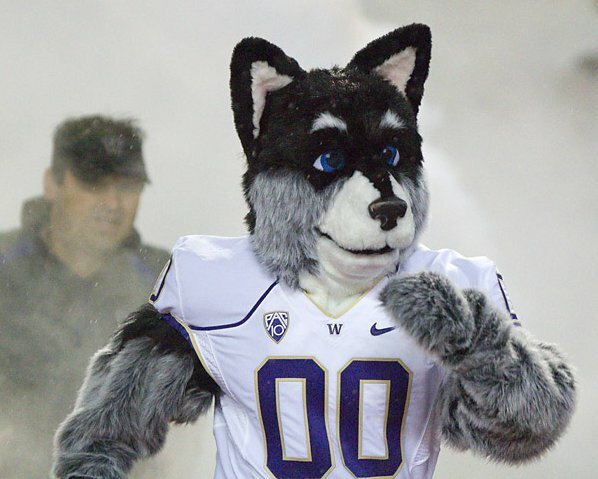 Wikipedia informs me our mascot is Harry the Husky. Um, okay. Purdue Pete is way cooler. 2. Purple and gold, right? …*checks Wikipedia* Phew, I’m right. It’s not some crazy-specific description like Purdue’s “old gold” (yes, there is a difference). 3. I have no goddamn idea. The only reason I learned Purdue’s fight song was because we were basically brainwashed during freshmen orientation. 4. Division I, Pac 10. I only know this from going to my undergrad at another Division I school. 7. I went on a bus by it once! 2 points. I am a graduate student! Hey, I’m not as bad as some people. I’ve now been inside seven buildings on campus! …Though I’ve only been inside two of those more than once. Sigh. At Whitman College we didn’t even have a football team, though our Lacrosse and Ultimate Frisbee teams were mighty and to be feared.Our Mascot – The Fighting Missionary. Not going to lie, even though I’m a grad student I fell into the 8-point category for exactly the reason Cham outlines…I think I even got bonus points as I know lyrics to our school’s fight song that aren’t well-known (only the first verse and the refrain are taught to Frosh). Also, our fight song has a dance. Go Queen’s! I could not answer a single one of those questions, although I have a sneaky suspicion that one of our school colours is maroon. Perhaps the other one is gray. Or gold. Maybe. I never understood the obsession with sports at American unis… here, the only people who care about the sports most of the time are the people in the clubs (the group from whom the team are selected) and their friends. I guess most people at Lancaster pay vague attention during Roses (annual multi-discipline sports tournament against York).Note: I was an undergrad at Lancaster, and I have no idea if any of those things even exist… head coaches certainly don’t, our teams are student-run… but even if there are British equivalents, I have no idea about them. I know which colour rose we are, because I actually know some history. You know you watch too much college football when you can answer several of these questions about a school you’ve never attended and have no connection to. BTW, Q5=Washington State Cougars and Q6=Steve Sarkasian. See what I mean? There’s something about college sports that appeals to me more than professional ones. Maybe it’s because they’re not playing for money (okay so they’re playing for the chance to one day make a lot of money in the big leagues) or because university teams typically have a lot more “local” talent than the pro teams. When I cheer for the Detroit Red Wings (pro hockey team), I’m rooting for a bunch of Russians and Swedes. When I cheer for U of Michigan hockey, I’m mostly rooting for homegrown talent–literally people I went to high school with. It gives rooting for the home team more meaning to me. I’m staying at the same institution for grad school, but I can only score about 2 points (and maybe make guesses for 1-2 more). I don’t necessarily think that’s a bad thing, though. Not going to lie, I’ve lived in Washington my whole life and I only got three points. Which makes sense, really, since I dated an undergrad at UW once. I don’t even know any of this about my undergrad school. Lessee…I know our mascot’s species, but not his name;I guessed two of our three colours (yellow and blue);And we’re not in the NCAA and don’t have a football team.0.66 points and I haven’t even started grad school applications yet! I guess you could attribute it to the whole “tribe” mentality. Following college sports and meeting up with other fans is a modern-day ritual that binds people closer together. When you’re an alumnus you can get together with your fellow grads and reminisce about your college days while having a drink and watching your school play on TV. Everyone tends to get in on the action, regardless of whether or not they actually care about sports. It’s just a good time…and an excuse to drink, if nothing else. Maybe it’s just my Ignorant Canadian-ness, but what’s a “fight song”? Purdue’s a division I school!? …really? You sure? Apparently I only scored a two, because I’ve been in the football stadium for something other than a sporting event. I thought I had a three, but I was informed that I was actually wrong about what the school colors were. The sad part. I did my undergrad here. I’m not sure. I think they play it when the game starts and the team scores a touchdown or something? So I just looked it up. Apparently, my school’s runs as follows:Fight on, Sacramento StateFight on to victoryThe Hornet is on the wing,The foe will know that we can show themWe’re meant for fame and glory,All the World will knowThe Hornet’s NEST is BEST in the WEST (Shout) BY TEST!Sacramento State, (Shout) LET’S GO!! !Go, Go, Go, Go, Go.Fight, Fight, Fight, Fight, Fight.Go, Fight, Go, Fight, Win.I wonder if whoever wrote that is still as proud of it now as they were at five when all those grown-ups took an interest in their scribblings. I scored a zero, I guess law students are as bad as grad students. The sad thing is that I tried doing it for my undergrad and still winded up with a two. I went to Syracuse, though, so “Otto the Orange” and the school color of “orange” tend to be notable. Seriously, a mascot that was a piece of fruit that could not even grow in the local climate is hard to forget. How exactly does an orange fight anything? It is at the bottom of the food chain. Um… I’m an undergrad and I only got 1 point. All I got right was the mascot for my school. Oh well, I’m not big on sports; I’m a geek. I think the thing that amazes most non-USAnian sport lovers is the amount of money invested in university (and school) sports teams.A question about a university’s “stadium” draws a blank look from us – the idea of having the money for such a building at a *university* is astonishing.I played football (Australian Rules) for several years for a local university team (Australian National University in Canberra), not because I was a student, but because it was convenient to get to training after work. We played on a ground for which the only infrastructure was a four room shed – one room for each team, one for the umpires and a canteen which doubled as a store room. The ground has since been upgraded – there are now a few rows of bench seating which might take about 50 people. I went to UT-Austin. No question of the school colors there. Nobody wears the UT logo in any other color and it’s everywhere! Similar. I’m an undergrad who got a whole two points (the first two questions), and the only reason I got those is that as president of the fencing club I have mock dueled the mascot in the homecoming parade and the fact that everything is plastered with purple and white around here.I’m not even going to end up knowing those things about where I end up in grad school, I can almost guarantee it. I scored a 4, but that’s because I tend to retain information even when it’s shoved in my face, not because I sought any of it out. In Australia we also have our own institute which puts a lot of money into training sports people, therefore the whole scouting for talent at universities becomes irrelevant. As far as I’m aware the only people that do sport on campus are usually those that live in one of the colleges or, as you said, other individuals living in surrounding areas, otherwise it is just more convenient to play for your local team. I actually scored six, but I did do my undergrad at the same school. And my wife is a professor. We used to eat lunch together in the stadium seats on nice days, plus it’s a good shortcut from parking to class, so pretty much everyone has been in the stadium. Colors are easy because they’re red and black. And the zoo has a live version of the mascot with the same name, of which my 4 year old is a huge fan. Wait, maybe it has a different name? In which case I get a five. The main rival is easy too, since they overwhelm the place on game day and screw up traffic and parking. I do not know the fight song, or the coach’s name. I went to Carnegie Mellon for undergrad and I don’t think I can really answer any of them except for the mascot question – it was a scotty dog. I was only in the stadium because we had commencement and graduation there and otherwise, nobody gives a damn about our sports team. Our marching band was quite cool though. It’s obvious the comic was drawn by someone who did not go to geology grad school at the University of Wisconsin where we used to (and still) attend football, basketball AND hockey games, and know the fight song and special rituals and incantations for all said sports. Geek-jocks for life!Oh, and:On Wisconsin, On Wisconsin, plunge right through that line.Run the ball clear down the field, touchdown sure this time.On Wisconsin, On Wisconsin, fight on for her fame.Fight, fellows, fight, fight, fight, we’ll win this game.On Wisconsin, On Wisconsin, stand up Badgers sing.”Forward” is our driving spirit, loyal voices ring.On Wisconsin, On Wisconsin, raise her glowing flame.Stand, fellows, let us now salute her name. My score is either 0 or 2, depending on what “stadium” means. My grad school didn’t really have a stadium, just a field with bleachers, & I’m pretty sure the football field doubled as a lacrosse field.Re: Dawgs. It seems unlikely, but I don’t suppose a lot of your undergrads are from Mississippi or Georgia … ? OK, so I just googled to see if I was right about the mascot name. Apparently it doesn’t have a proper name. So minus one there. And what I thought was our biggest rivalry isn’t even listed on the list of rivalries on Wikipedia. Of course one of those is new and manufactured, another is old and can hardly be called a real rivalry. Anyway, the one I thought of is still the one that brings in the most fans of the opposing team. Nevertheless, minus one. So my six is now a four. Same category though.